Even without big name players like CB Jason Verrett, WR Mike Williams, or WR Doug Baldwin, there were plenty of fireworks in the first NFL game at the Stub Hub Center in Los Angeles. Philip Rivers hit Antonio Gates for a touchdown to open the scoring as was so often the case in San Diego, putting the Chargers ahead of Russell Wilson and co early in the game, but from that point on it was almost all Seattle. LB Terence Garvin scored a defensive touchdown on an interception, and the Seahawks rode three more turnovers to a 48 to 17 victory. 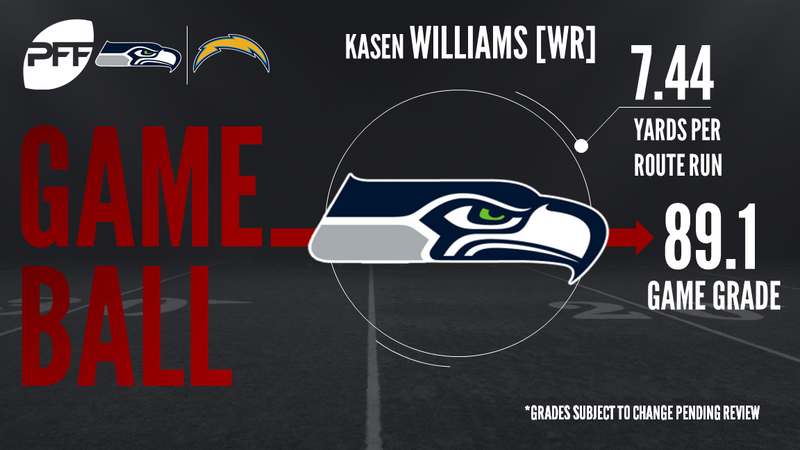 With that, we refocus and give you our PFF exclusive takeaways from the contest for each team. All four of Williams’ catches went for at least 28 yards, including a couple of highlight reel-catches, as he racked up 119 receiving yards against Chargers’ CB Michael Davis. He had a 118.8 wide receiver rating for the game. The focus has been on how the Seahawks’ top three running backs will split snaps and touches this season, but Mike Davis had a nice outing to try and push himself into that mix. He forced four missed tackles on eight carries, and was hit in the backfield often enough to have more yards after contact (36) than rushing yards (33). Cassius Marsh was Seattle’s most effective pass rusher as he recorded three pressures on only 14 pass rush snaps. As a team, the Seahawks recorded 11 hurries and 4 sacks in the game. Rookie DT Nazair Jones had an impact in his first preseason game, recording a quarterback hit to go along with a batted pass which led to an interception. He had a pass rush grade of 82.6, which was only behind Cassius Marsh. Finally, he led the defensive unit with 34 total snaps. It was a tough night for the Chargers offense as the highest graded player on offense with more than 10 snaps was WR Travis Benjamin with an overall grade of 78.6. Benjamin was targeted twice and caught both for a total of 89 yards. A chunk of those came from a deep ball that was hauled in for a 74-yard touchdown. The Chargers starting offensive line performed well on limited snaps, with guard Kenny Wiggins leading the group with a grade of 77.3 on 13 snaps. Apart from only one quarterback hurry, which came against LG Matt Slauson, the first string unit kept a clean pocket. Not much went right for the Chargers’ defense, and McCain didn’t play all that well against the run, but he was easily the most productive pass rusher in the game for either team. McCain finished the night one sack, two hits, and three hurries on 20 snaps rushing the quarterback. With LB Denzel Perryman going down with what may be serious ankle injury, Korey Toomer sits as the next man up on the depth chart at middle linebacker. While Toomer had two defensive stops and a quarterback hurry, he also missed a game-high four tackles, making it even more worrisome if Perryman is unavailable long-term.